Are you an avid free software supporter who is currently using any Arch based distribution? I’ve got a small tip for you! You can now easily find the installed proprietary packages in Arch Linux and its variants such as Antergos, Manjaro Linux etc. You don’t need to refer the license details of the installed package in its website or use any external tool to find out whether the package is free or proprietary. A fellow developer has developed an utility named “Absolutely Proprietary”, a proprietary package detector for arch-based distributions. It compares all installed packages in your Arch based system against Parabola’s package blacklist and aur-blacklist and then prints your Stallman Freedom Index (free/total). Additionally, you can save the list to a file and share or compare it with other systems/users. Before installing it, Make sure you have installed python and git. This command will download all contents in a directory called ‘absolutely-proprietary’ in your current working directory. This command will download the blacklist.txt, aur-blacklist.txt and compare the locally installed packages with the remote packages and displays the installed proprietary packages in your Arch Linux system. 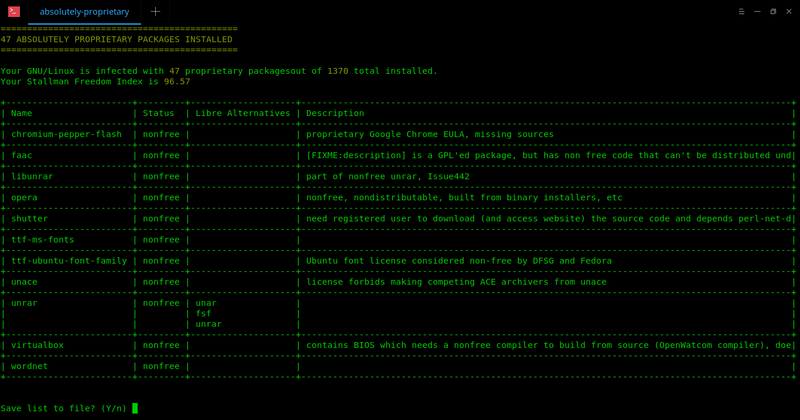 Your GNU/Linux is infected with 47 proprietary packages out of 1370 total installed. As you can see, I have 47 proprietary packages in my system. Like I said already, we can save it to a file and review them later. To do so, jut press ‘y’ when you are prompted to save the list in a file. Then press ‘y’ to accept the defaults or hit ‘n’ to save it in your preferred format and location. using the "less -S /home/sk/absolutely-proprietary/y.md"
As you may noticed, I have only the nonfree packages. It will display two more type of packages such as semifree, uses-nonfree. nonfree: This package is blatantly nonfree software. semifree: This package is mostly free, but contains some nonfree software. uses-nonfree: This package depends on, recommends, or otherwise inappropriately integrates with other nonfree software or services. Another notable feature of this utility is it’s not just displays the propriety packages, but also alternatives to such packages. Hope this helps. I will be soon here with another useful guide soon. Stay tuned!